Suitable for children over the age of one, our durable Four Shape Sorter has been crafted from long lasting wood. Featuring a sturdy base with protruding pegs, this entire set is finished with an array of brightly coloured and assorted shape discs. 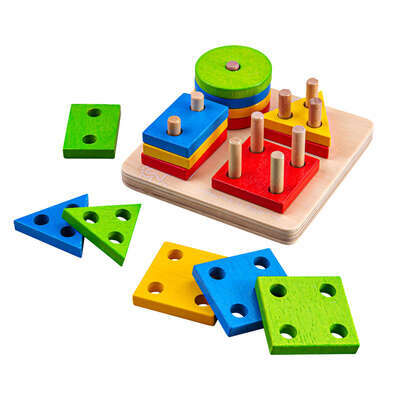 Challenge your pupils to match up the peg arrangements with the holes drilled into each shape to help develop hand eye coordination and fine motor skills. This simply game promises to offer hours of fun while improving their concentration and dexterity through challenging play. Why not consider ourShape Posting Box or Rolling Shape Sorter as well? Our Animal Shape Lorry also combines education in animals with the improvement of their developmental skills.